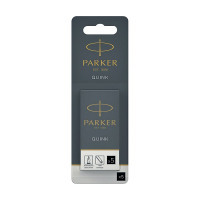 • Parker writing instruments are produced to the most exacting standards and only genuine Parker Quink inks and refills should be used. Use Quink Ink Cartridges for the smooth, well-defined lines you've come to expect from your Parker handwriting pen. Just open up your Parker pen and slot in a fresh cartridge to get started right away. High quality Quink ink ensures smooth-flowing handwriting that dries quickly on the page for smudge-free results. This pack contains black ink for a classic and rich pen tone.